Audubon plantation country, the region between Natchez, Mississippi, and Louisiana’s Feliciana parishes, provided the inspiration for artist John James Audubon’s bird masterpieces. Countless visitors still flock to the area to enjoy the natural beauty of its landscape, the grandeur of its plantation architecture, the palpable history of its settlements, and, especially, the delicious bounty of its hospitality. 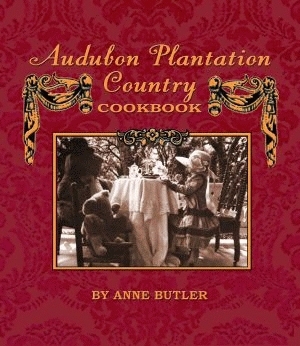 Audubon Plantation Country Cookbook is a collection of heirloom recipes, family legends, historical facts, vintage photographs, and humorous anecdotes from this area that is as rich in cuisine as it is in history. This cookbook, which was named Best New Cookbook of the Year by Louisiana Life magazine, creates a complete view of life in Audubon plantation country. A graduate of Sweet Briar College in Virginia, with an MA in English from Humboldt State in California, Anne Butler has worked as a journalist, writer, and editor on both coasts. She is chatelaine of Bulter Greenwood Plantation bed and breakfast, a 1790s family plantation located near St. Francisville, Louisiana. Butler claims to now know “just about everything there is to know about the area” and is spreading this knowledge through her award-winning children’s books, travel books, and Audubon Plantation Country Cookbook. 175 sepia photos 3 sepia illus. Indexes 2nd ed. ; First Pelican ed.